The original Queen Mary was retired from service in 1967 and turned into a floating attraction in Long Beach, California. But, in January 2004, Cunard, builders of luxury ocean liners since 1840, unveiled their flagship and successor, Queen Mary 2, or QM2 for short, the longest, tallest, widest, most expensive and grandest ocean liner in the world — our vessel for nearly a week. Cathy and I have been friends for two decades, yet neither of us has ever cruised before. We arrive at the terminal by mid-afternoon. After presenting our passports and posing for our multi-purpose onboard charge/ID card/room key at the terminal, we are shown to the QM2’s top accommodations, suites in the Queen’s Grill on Deck 10. Noly, our personal butler, and his assistant Erwin, greet us as we settle in (and handle all subsequent requests during our voyage). The spacious, buttery-colored suite includes a marble bath, walk-in closet, flat screen TV, en-suite bar with champagne (Veuve Clicquot), fresh flowers and an eight-foot long balcony. We select our pillows from a menu of eight and two bottles of liquor to stock our stateroom. Noly returns with all that and canapés (which are delivered to our room nightly). 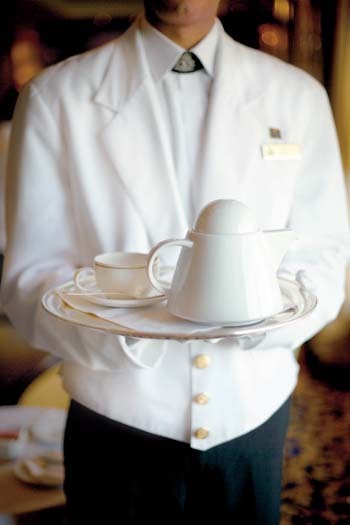 He informs us that, if we desire it, room service is available 24 hours a day. With our finery unpacked, we study the daily program, a newsletter detailing the QM2’s many activities from sunup to sundown. Cathy attacks the task with fearsome efficiency, mapping out her movements by the hour, determined to experience as much as possible during the voyage; I take a more languid approach. The options are breathtakingly varied in scope, from time-honored shuffleboard to an au courant beading workshop; from Alcoholic Anonymous and Red Hat Society meetings to bridge lessons; from Oxford University lectures (“The Middle East and the West,” and “Urban Design”) to near first-run movies (Capote and Pride and Prejudice); from bingo to computer classes to Pilates. There are also five pools, a casino, gym, a disco, afternoon tea, wine tastings, art auctions, and numerous treatments at the 20,000-square foot Canyon Ranch Spa, the only spa on the ocean. Entertainment options include a harpist; the largest ballroom at sea; jazz in the Chart Room and Commodore Club; a performance by the London Royal Academy of Dramatic Arts of Noel Coward’s Fallen Angels in the Royal Court Theatre; performers Mysterique, illusionists/dancers; and Imax-like films in Illuminations, the world’s only floating planetarium. There is also tony shopping onboard (Chopard, Hermes, Harrod’s) and 10 restaurants to sample, including the Queens Grill, exclusively for its passenger guests and the intimate Todd English, the eponymous outpost of the famed Boston chef. Cathy, whose teenage children are home in Nashville, notes the existence of the Play Zone, the children’s program supervised by British nannies. We pour ourselves a glass — and then another — of champagne while debating the relative merits of each possible experience. I order complimentary personalized stationary with the sailing date and “bon voyage” and then we set out to discover the ship. 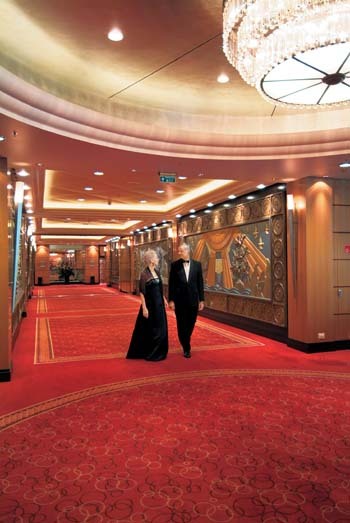 QM2 positively gleams, with not a surface sullied by a fingerprint nor a stray bit of paper. The staff — nearly 1300 (that’s a1:2 staff/guest ratio) manages to be both attentive and friendly, greeting you without being pretentious or stiff, quite a feat in my book. 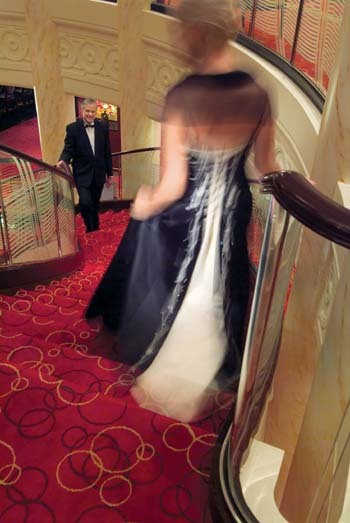 We walk down the seemingly endless corridors and memorize the staircase nearest our stateroom (C). We discover the library on Deck 8, which becomes my immediate favorite place, with its windows overlooking the bow and more than 8000 books and magazines, two librarians and multiple computer terminals for checking e-mail. And then, we set sail, as the Captain gives his first address, welcoming us aboard and detailing our route. Cathy hands me a patch to place behind my ear to ward off seasickness and we hug each other excitedly. There will be three formal, three informal, and two casual nights, but we enjoy dressing up each night for dinner. (We did all that shopping, you see.) The cruise hostess, Amanda, informs us that citizens from more than 30 countries are onboard, although the majority of passengers are from the U.S. and England. Looking around, most of the passengers are in their 50s or older, although we see some families, teens, and younger couples. Sleep comes easily that first night as the waves produce a watery lullaby. On our second day, we dine with the Captain, Christopher Rynd, in the Britannia Room, the most glamorous and largest dining venue onboard. With a sweeping staircase, two levels, a soaring ceiling, white-gloved waiters, and a grandeur that conjures another time, it is a very special room. The room glows with candlelight. Is that my tinkly laughter? Are we sitting up a bit straighter? The meal rises to a few culinary heights, several bottles of wine are drained, and the lean, white-bearded Rynd is gracious and entertaining. The evening evokes some of the ship’s glorious past. Later we are instructed to “retard” our clocks one hour each night so that we gain back our time upon arrival in New York. I fall asleep to an occasional shudder and non-specific creaking, sounds that are already becoming comforting. The days at sea possess a certain romantic rhythm; a leisurely languor. 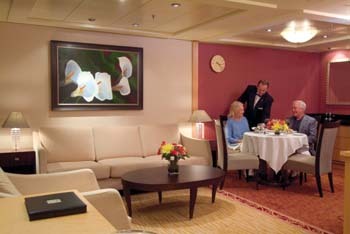 There are the Captain’s daily addresses at 9 a.m. and noon, followed by lunch, perhaps sunning by the pool, then afternoon tea with finger sandwiches and scones accompanied by an orchestra, a discussion with a professor about Turkey’s possible entrance into the EU, and a late afternoon nap. I pass many pleasant hours perusing volumes both old and new at the library, light flooding into its windows onto lustrous woods and brass. I marvel that, though the ship is nearly at capacity, no single venue is overcrowded. I assume that this is because of the plethora of venues. This is my life, for six days and I’ve quickly become very used to it; although it bears no resemblance to my life at home. I join a reunion of 15 former passengers, who are sharing their memories and reviewing memorabilia from previous crossings. Londoner Nigel Salts was onboard the first Queen Mary in 1951 as an 11-year old and remembers spending most of his time in the cinema. “It’s the greatest ship in the world,” he says, “even better than the original. I never thought they could reproduce it, but they have spared no expense.” John Leach and his wife Mavis of Southampton are celebrating their 62nd anniversary; the voyage is a gift from their children who have also joined them on the cruise. Leach is a former officer’s steward. He is enjoying “being looked after so well,” a much-deserved treat after doing the same so many years before for so many others himself. Just as Cathy and I begin to feel a bit hermetically sealed, the seas subside and the sun finally comes out. We can now circle the deck for some fresh air and exercise. It's a good thing, too, because we splash out on a superb meal at Todd English (which carries a $30 supplement for a four-course dinner) that evening. The truffled potato love letters with Madeira glaze are astonishingly rich and musky, the fig and gorgonzola flatbread sweet and savory, the grilled beef tenderloin over garlic spinach, succulent, and the molten chocolate cake decadent. I return the next day for lunch (a steal at $20 for three courses). I’ve noticed that our sommelier, Angelo, discreetly shadows us (and his other Queen’s Grill guests) as we dine throughout the ship, serving wines from different regions during the voyage. We sample wonderful Italian, Australian, and French bottles paired with our various meals. As a special treat, he even prepares us a simple, delicious tomato and basil spaghetti lunch. It is these thoughtful touches that lend the QM2 its legendary civility and graciousness and inspire the easy, spirited sociability that memories are made of. On the final, early morning of our crossing, as the skyline of New York rises ahead of us, Cathy and I realize, that on the QM2, the journey is the destination — and a heady, coveted destination it is. As we step aboard, giddy with anticipation, my friend Cathy and I join the illustrious ranks of the rich and famous — politicians, millionaires, actors and royalty — who throughout history have sailed the Atlantic waters aboard one of the Queens. 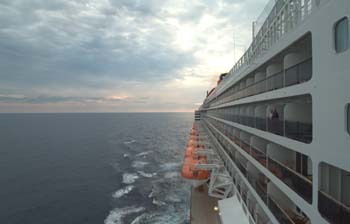 With a suitcase full of appropriately posh new clothes, we flew from Atlanta to London the day before to join the Queen Mary 2 in Southampton for the six-day transatlantic crossing to New York. 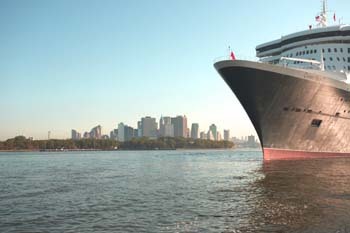 • The QM2 is 1,132 feet in length — longer than the Eiffel Tower is tall. • Her 17 decks are equal to the height of a 23-story building. • She is three times the size of the Titanic. • Her maximum speed is more than 30 knots per hour. • She was built at a cost of $800 million. • It took 1 million hours to design and 8 million hours to build her. • More than one million corks are popped onboard annually. 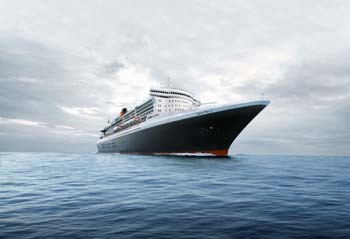 • The QM2 brews its own beer onboard. 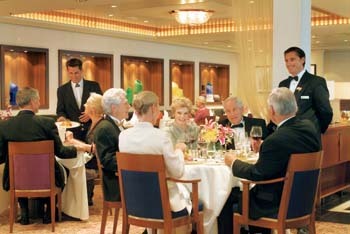 • Up to 14,000 meals are served per day for crew and guests. • She employs 150 chefs working in 9 galleys. • The ship maintains a butchery, fish mongery, and bakery on board. • The QM2 is the world’s single largest consumer of caviar. • 62,400 pounds of lobster are consumed annually on the QM2. 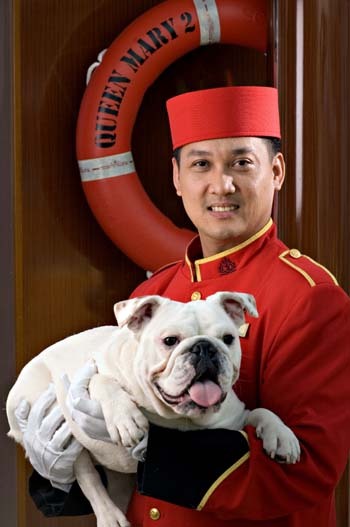 • The QM2 staff hails from 40 different countries.